Little Sugar Creek Greenway is a linear park and stream restoration project in Mecklenburg County, North Carolina. When completed it will consist of twenty miles of trails and paved walkways running from Cordelia Park just north of uptown Charlotte, then south through midtown Charlotte, and continuing all the way to the South Carolina state line. Greenways are narrow strips of land, planted and managed to provide both human recreation and wildlife habitat. Greenways along streams, such as Little Sugar Creek, improve water quality and help control flooding. There are about 37 miles of developed greenways in Mecklenburg County, of which this is only one. The two urban sections of the Little Sugar Creek Greenway were championed by Central Piedmont Community College president Tony Zeiss and together provide five unbroken miles of paved walkway from East 7th Street southward to Brandywine Road. The completed part of the Little Sugar Creek Greenway can be divided into four sections going downstream from north to south. Paved walkway follows Little Sugar Creek and extends for .95 miles from Parkwood Avenue on the southern border of Cordelia Park to Greenway Crescent Lane and East 12th street just south of Alexander Street Park. Gulf Coast spiny softshell turtles can be seen in this part of the creek. This section does not currently connect with the rest of the greenway. This section connects with the urban section through the Morehead Street underpass. The first part going south is a straight section directly on the banks of Sugar Creek known as the the Liz Hair Nature Walk, completed in September 2005. It extends for .65 miles from Morehead Street to East Boulevard and is adjacent to the Carolinas Healthcare System complex. The next section runs from East Boulevard to Princeton Avenue, passing by the Charlotte Nature Museum and through Freedom Park. Next is a so-called overland connector which utilizes existing sidewalk for .42 miles along Jameston Drive. The paved part of the greenway resumes again at Hillside Avenue and continues on to Brandywine Road, ending behind the Park Road Shopping Center. This last section features wetland filtration ponds and explanatory signage. Here's the our members favorite photos of "Recreational Areas in Charlotte". 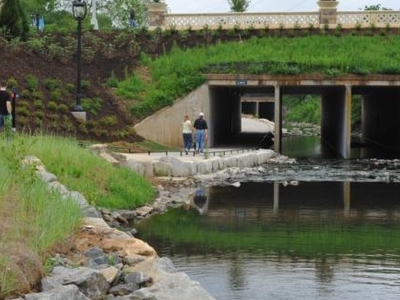 Upload your photo of Little Sugar Creek Greenway!